Hiya guys! 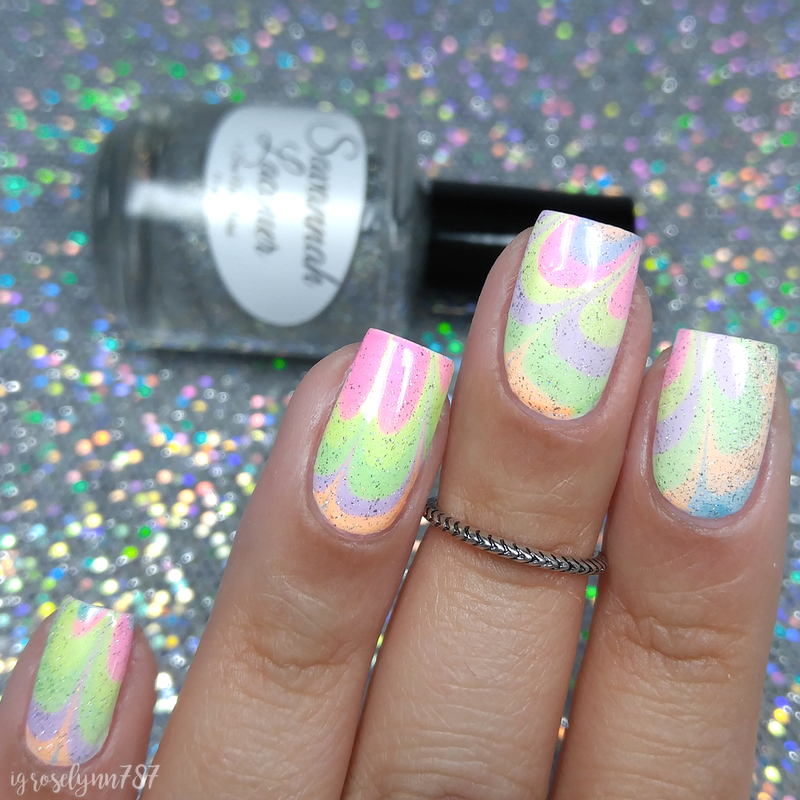 Today I'm sharing five watermarbles created using the Salt Water Taffy Collection by Savannah Lacquer, including a holographic topper and clear marble polish. 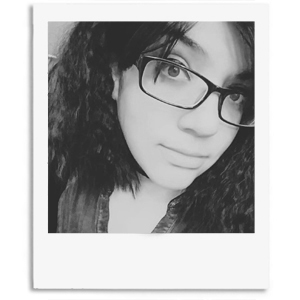 To be so honest, I have been going through severe depression and anxiety the past month. The night I sat down to watermarble was the most fun I have had since this year started. Seriously guys, fun with watermarbles is not a myth. Especially now with these polishes, but I'll stop gushing and let the watermarbles speak for themselves. Let's get to it! As I mentioned yesterday, the Salt Water Taffy Collection by Savannah Lacquer will be releasing this Friday, March 10th at 12pm Noon EST. If you'd like to check out my swatches head on over to yesterday's post. First up I used all six shimmer creams from the collection to create this watermarble. Of course, I had to do my favorite design 'the petal'! I think it showcases all the colors the best while making them really pop! Like with most of my watermarbles, I used a solid white base to start off. This is especially important with these polishes because they are so naturally sheer. Side note: can you believe I did two fingers at a time?! Seriously! The rings were spread so nicely in the water that it made it super easy to get more than one nail in. Next up I'll be using Salt Water, which is a clear water marbling polish. Basically this polish allows a transparent layer so that you can watermarble and the base of your manicure will show. In this case I used Salt Water along with Grape Taffy and Key Lime Taffy over a black holographic polish from Cupcake Polish. Unfortunately the concept for this marble was better in my head than in real life. I used Banana Taffy against a holographic pink from Cupcake Polish. I don't think the yellow ended up working so well against this hot pink because it's so sheer. It actually ended blending so it looks more peach than yellow. The last polish being released along side the collection is Sugar Coat, which is a holographic micro-flake. 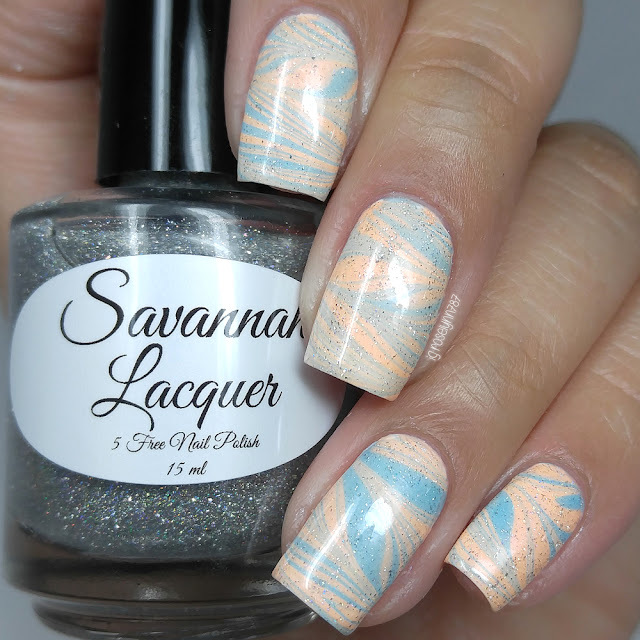 Adding a bit of sparkle to any watermarble... Or really any manicures you want! I love the fact that it ups the sparkle by having flakes along with the holo. Shown here is just one coat over my marble and sealed with a glossy topcoat. 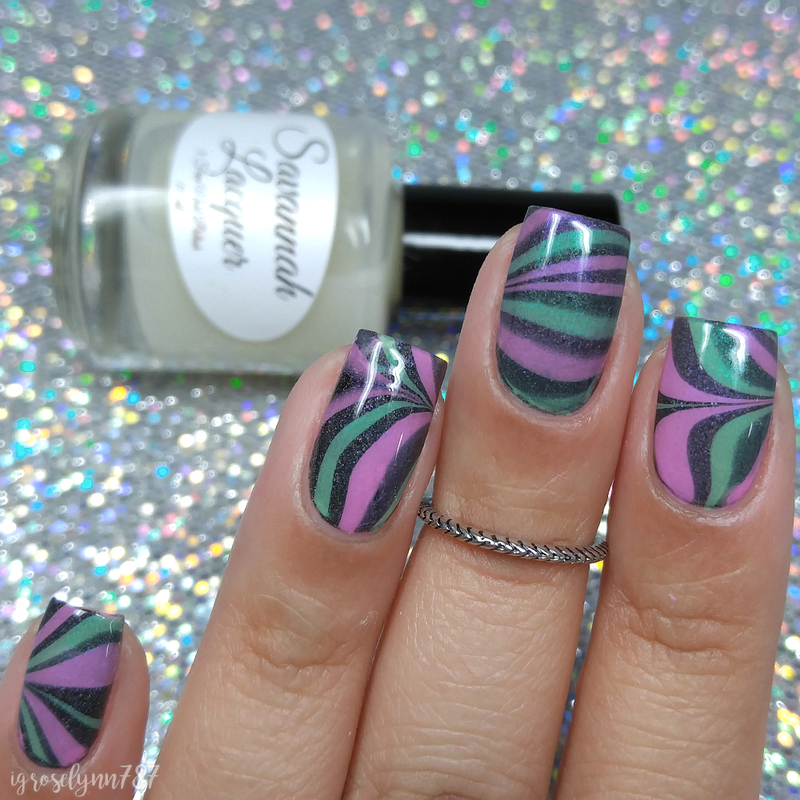 And here's the last watermarble of the night and my favorite as well. I was trying to do marble stripes but kind of failed in the best way possible haha. Instead I bring you downward petals! 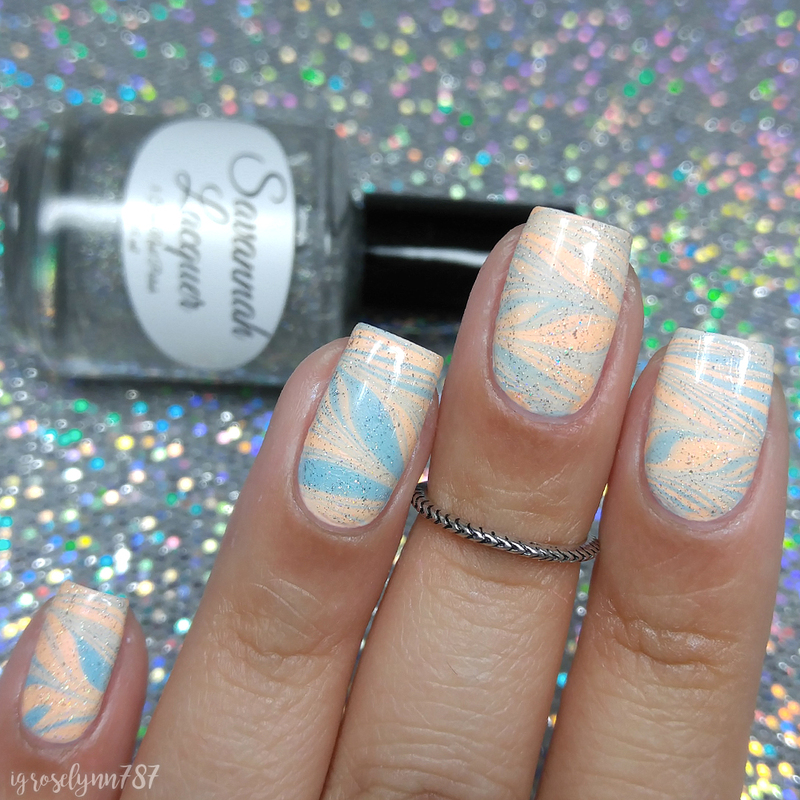 For this marble, I used the entire Salt Water Taffy Collection and topped it off with Sugar Coat. 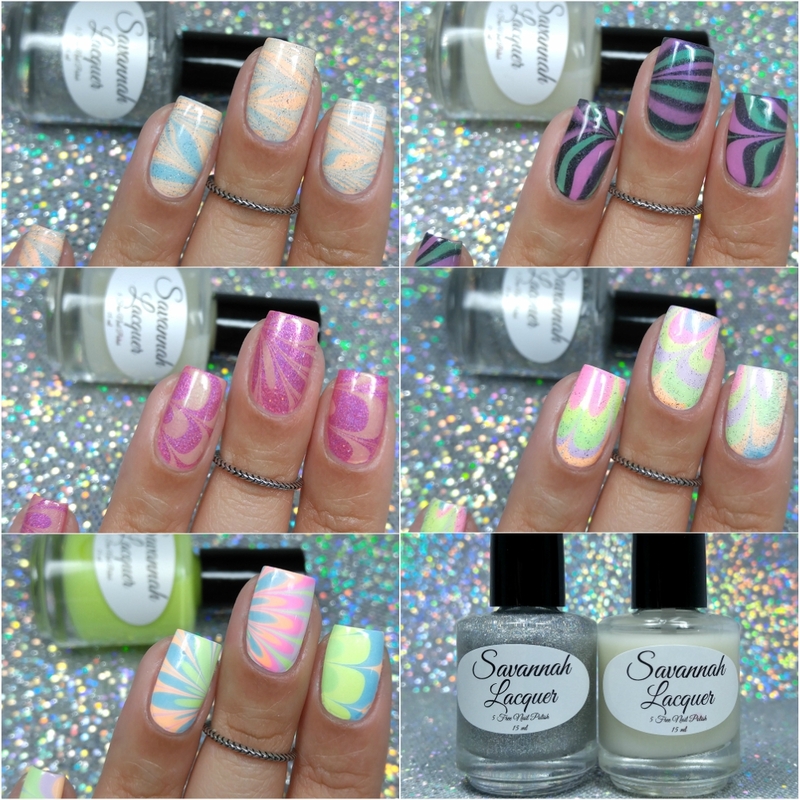 Overall these are really fantastic watermarbles polishes as they were designed to be! They made the whole process so fast and easy to do... And don't get it twisted I'm by far not an expert watermarbler. This was actually my first time doing a design in almost a year! So I highly recommend these if you're just starting out as a novice. But as I mentioned, be aware of the sheerness when using these against anything but a white basecoat. To recap, the Salt Water Taffy Collection by Savannah Lacquer will be releasing this Friday, March 10th at 12pm Noon EST. Each full-size (15mL) bottle will retail for $10 or the entire collection can be purchased for $55. The topper and clear water marble polish will be sold separately. Keep your chin up, one day at a time. Your marbles turned out amazing! So I clearly need to invest in this collection lol. I hope that you feel better soon! Now this is the way to get my attention! Amazing marbles!